Our 2019 Militaria Auctions will take place at 10 am (+8 G.M.T.) 28th April & 6th October – onsite at 2/135 Russell St, Morley. We are currently taking items for our 2019 auctions, so if you have any items of interest please feel free to get in contact with us. 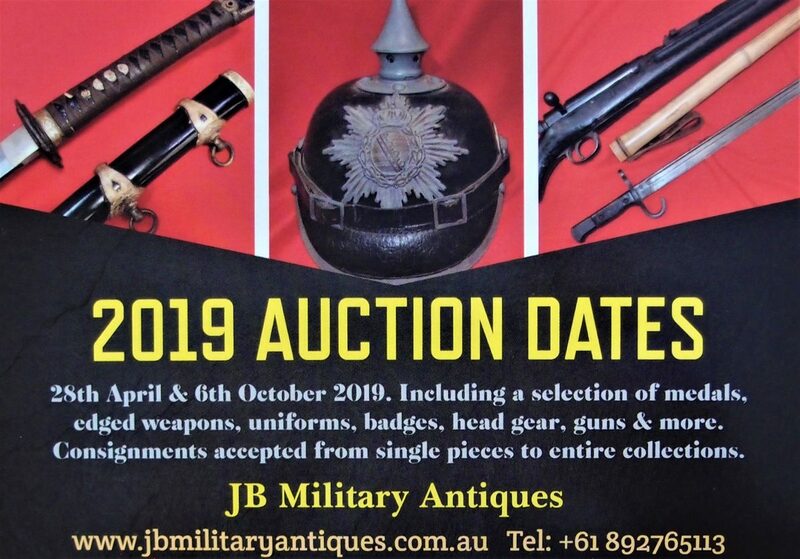 Please contact us on +61892765113 or email: jbmilitaria@westnet.com.au if you have any questions. All lots are guaranteed authentic unless otherwise described and come with a 90-day inspection/return period. Please contact us directly before the auction to arrange any prior phone or absentee bidding or if you have any questions or queries regarding the lot’s featured.